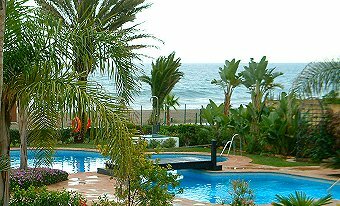 Only 10 seconds from the golden sandy beach of La Cala de Mijas on the Costa del Sol and 5 minutes stroll into the shopping and entertainment center. This apartment is perfect for family holidays. It is also available for long winter lets - email for details. Laguna swimming pools open directly onto the sandy beach. 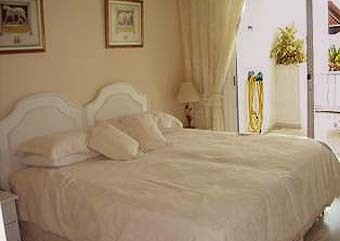 Bedrooms have twin beds that convert to "Emperor Doubles"
Lounge is beautifully furnished and opens to terrace with beach views. The two large bedrooms are both furnished with two single beds which can be ‘zipped & linked’ to make a luxurious 2 mtr. Emperor bed. One bedroom is en suite and both have fitted wardrobes. 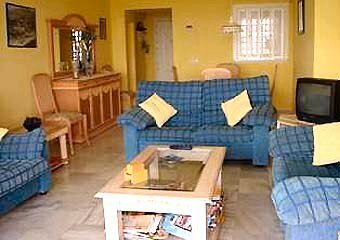 In addition there is a spacious family bathroom making this an ideal property for family beach holidays. There are tropical gardens to the front which offer very pleasant shaded areas during the hottest months plus the most amazing laguna swimming pool. The lounge opens via double sliding windows to a spacious private terrace. The terrace is furnished with comfortable sun loungers plus table & chairs. The patio enhances the seamless indoor/outdoor lifestyle we enjoy here on the Costa del Sol. Most of the year we eat outside. The lounge has a spacious dining area to seat 6 persons. There is Sky Satellite television in all rooms and HI Fi system in the lounge. 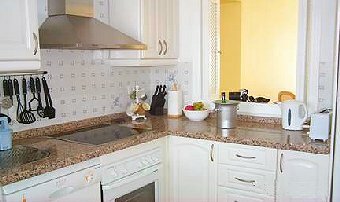 The modern kitchen is completely equipped to make your stay comfortable. There is a fridge freezer, microwave, washing machine, ceramic hobs and electric oven. The extract system vents directly to the outside. Shopping is easy from the apartment. The town center is only five minutes stroll. In La Cala you will find every kind of shop including a large modern supermarket - "SuperSol"
Entertainment is excellent in La Cala area with something for everyone close at hand. This is "Golf Valley" but in addition to golf there are a number of riding schools, splash parks and of course the Hippodrome which is the horse racing centre of the Costa del Sol. At the Hippodrome (Hipodromo) during the summer months horse racing provides a fun night out for the entire family.